Six orifice sizes: No. 0,1,2,3,4,5.
with Tripod support. Beaker not included. The flow formula for each cup in the series has been selected to provide results which are close as possible to an average of other similar Ford Cups. The flow formula as applied to the physical dimensions of each cup in the series has been confirmed with the use of standard oils traceable to the National Institute of Standards and Technology and other liquids from essentially zero viscosity to a viscosity proportional to 150 seconds flow time. Cup dimensions influencing flow time conformed to those specified in ASTM D1200 except for very minor adjustment of orifice diameter. Weight of the cup has been reduced 20% to minimize influence of cup temperature on the temperature of the material being measured. The top interior of the orifice has been shaped to provide a sharper break in the stream as the cup empties. The design also provides for a better definable orifice length with respect to theory. The taper fit of the orifice eliminates hard to clean areas. The orifice is readily removable with furnished wood dowel and inserted without the use of tools. The design of the bottom of the cup gives increased protection to the orifice. The drip ring has been deepened to accommodate a greater amount of material. A specially designed tripod support is available to enhance the use of the cup. It is helpful, and results will be more consistent, if all viscosity determinations are made in a room that is free from drafts or quick temperature change, and is within ±3°C (±5°F) of the viscosity measuring temperature of 25°C. Adjust the sample to measuring temperature, usually 25°C (77°F). Select the cup that will provide readings which are well within the cup range. Make sure that the cup is clean and place it into its support. Make sure that the cup is level. Place a finger under the cup orifice and fill the cup with bubble free test material. The cup is full when the meniscus disappears where the liquid joins the sidewall of the cup. If the cup is overfilled, scrape the access into the cup well with a spatula or by passing the cover plate across the top of the cup. Note that the finger can be removed from the orifice when the cover plate is in place. Start a timer as the cover plate is removed from the cup. Determine the temperature of the efflux stream. If there is a significant change during the test it should be repeated. Stop the timer at the first break of the efflux stream, one or two inches below the orifice. Record the cup type and number, measured temperature, and efflux time. For best accuracy, average three or more readings. Promptly clean the cup, giving special care to the orifice. Figure 5 The dimensions of the Gardco Standard Cup are shown in Figure 5 below. The internal dimensions conform to those specified in the ASTM Method D1200 except for the diameter of the orifice. Even here there is close agreement, but the diameter of the orifice is adjusted to bring the cup into conformity with the flow formula. 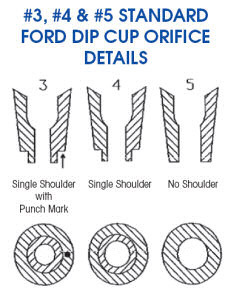 Most of the Ford cups produced by others to date have an external cup diameter that extends below the level of the orifice. This results in a large amount of metal adjacent to the orifice which can adversely affect the accuracy of the reading if the cup and material being measured are not at the same temperature at the time the measurement is started. Most of this mass of metal has been removed in the new design. The bottom of the cup is designed to extend below the orifice. This design not only provides adequate stability for the cup when resting upright on a surface, but it also protects the orifice from damage. This protection is also closer to the orifice than in other designs. 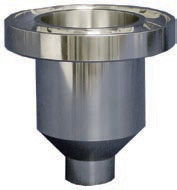 The drip ring surrounding the top of the cup has been increased in volume to accommodate a greater amount of material. This change con minimize the frequency of cleaning or reduce spillage in long series of tests. 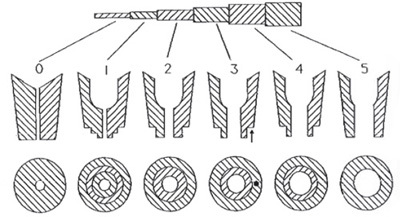 Figure 6 at right is a cross section of the orifice used in both the Gardco Standard and the Gardco Ford Dip Cups. Note that the upper interior portion, following the conversion from the slope of the cup interior is spherical in shape rather than conical. It has been found that this shape provides a cleaner break of the stream as the cup empties. In addition, the length of the orifice is better defined in accordance with theory. The "0" orifice does not have this feature as it is longer and has less need of this shape. In the new design the exterior of the brass orifice is a truncated cone, sized to match a conical section in the body of the cup. This design insures close fit with no gaps between the body and the orifice either at the top or bottom. This design also eliminates the hard to clean areas that exist in most other designs. Orifice Removal: To remove the orifice, simply place the cup upside down on a solid surface, place the wood dowel rod furnished with each cup against the orifice and tap the dowel rod with an object such as a paperweight. To insert the orifice, place the cup on a solid surface right side up, drop the orifice in place, place the dowel rod into the spherical section of the orifice and tap the dowel rod with a heavy object. The GARDCO viscosity cups are precision instruments. To maintain them in their initial condition and calibration, they should be cleaned following each use with a suitable solvent and a soft brush or lint-free cloth. Particular care should be used in cleaning the orifice to avoid leaving deposits or scratches on the internal surfaces. Nylon fishing line has been found to be suitable. It is good practice to retain a pint of standard calibration oil which can be used to periodically insure that the cup maintains initial calibration. Orifice interchange is not applicable to certified cups. Production tolerance on the Standard cup, the Standard Dip cup and the orifice whether it be #3, #4 or #5 is sufficiently close to permit interchange of orifices in either cup or between cups. For convenience and for best possible results, however, it is recommended that such interchanges be held to a minimum. These orifices will fit both our Standard Series and Dip Series Ford Cups. 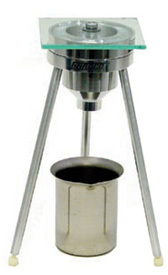 This cup has the same capacity as the Standard Laboratory type Ford Viscosity Cup designed for use with a stand. However, this new cup is fitted with a red anodized aluminum handle and the drip ring at the top of the cup has been eliminated. Caution: Silicone fluids should not be used to calibrate viscosity cups. These materials change tile interface between the cup surface and the test material and therefore change the cup calibration. The following Is taken from ASTM D445: Viscometers used for silicone fluids should be reserved for the exclusive use of such fluids. Solvent washing from these viscometers should not be used for cleaning other viscometers. Ford Dip Cup Number Standard Oil Approximate Centistoke Value Efflux Time In Secs. To find the exact efflux time in seconds, substitute the centistoke value of the oil from the bottle label in the conversion table furnished with the cup. Read from the table the applicable efflux time in seconds or use the formula on the reverse side of the table. The Gardco Standard Ford Dip Cup has all the advantages listed for the Standard series except it does not have a overflow well at the top of the cup and a red anodized handle is attached for support. The bottom of the cup is designed to extend below the orifice This design not only provides adequate stability for the cup when resting upright on a surface, but also protects the orifice from damage. 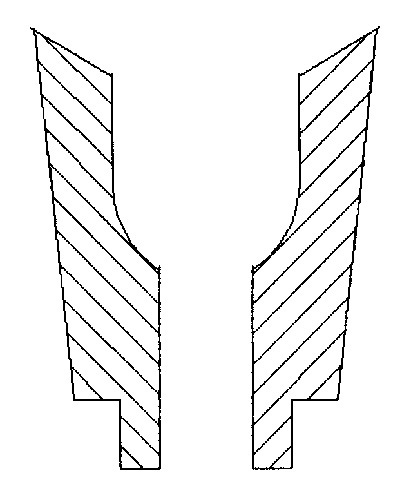 The design of the bottom of the cup, as can be seen from the drawing, causes all material draining from the outside of the cup to flow away from the orifice and not influence the rate of flow from the orifice. Close production tolerance permits replacement of the precision "pop-in, pop-out" orifice without loss of accuracy and without tools. To remove the orifice, simply place the cup upside down on a solid cushioned surface. Place the wood dowel rod furnished with the cup against the orifice and tap the dowel rod lightly with a heavy object such as a paper weight. To insert the orifice, place the cup right side up. Carefully insert the orifice in place. Place the dowel rod into the spherical section of the orifice and tap the dowel rod with a heavy object. For Viscosity Measurements of Very Thin Paints, Inks, Solvents, Lacquers, Adhesives, and Coating Materials of All Kinds. All Gardco Ford cups are alodine finished machined aluminum with removable brass orifice. Directly related to Standard Ford Cup series designed, standardized and produced by the Paul N. Gardner Company, Inc.
A mathematical formula developed for each Mini Ford Dip Cup in the series, relating time in seconds to centistoke viscosity defines cup flow characteristics with respect to standard oils traceable to U.S. National Institute of Standards & Technology. The resulting formula have been solved for each tenth second within the recommended cup range. A table with this information as well as the cup formula is furnished free with each cup. Adjust the temperature of the material to be measured, if necessary. Lower the cup into the material so that the cup rim is submerged. Place a thermometer into the cup as it is immersed and determine the temperature of the confined sample. Remove thermometer. Quickly raise the cup from the material, high enough to easily observe the efflux stream and at the same time, start the timer. Closely observe the efflux stream and stop the timer at the first break in the stream, one to two inches below the orifice. Record the cup used (ex., Gardco Mini Dip #4), the measured temperature and the efflux time. If the efflux time is immediately converted to Gardco Standard Cup time by multiplying by two, it should be so noted. Promptly clean the cup with close attention to the orifice. Time in seconds obtained with the dip series is just one half that obtained with the standard series. Simply multiply the seconds obtained by two and the results are directly converted to centistokes by the same theory presented for the standard series. 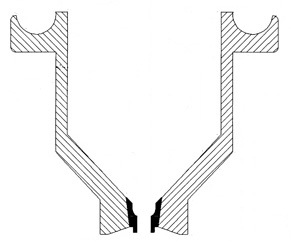 This relationship is obtained by producing the dip series with an internal vertical cross section equal to just one half of the standard series and adjusting the cup height to obtain desired results. 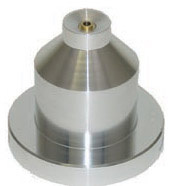 The orifice series used in the dip cup is identical to the series used in the standard cup. The design of the bottom of the cup causes all material draining from the outside of the cup to flow away from the orifice and not to influence the rate of flow from the orifice.